By this time next year, construction should be well under way on a new 100,000-square-foot Cabela’s store in Anchorage, the first in Alaska and most northerly outlet for the Nebraska-based company. The announcement was made today in a press release. The store will be located a couple miles southwest of the airport and employ 200 part- and full-time staffers. There will also be the traditional huge aquarium, Gun Library, Bargain Cave and Fudge Shop. A spokesman said Cabela’s loves Alaska, has great customers there and has wanted to build an outlet there. You have through this weekend to comment on an assessment of Alaska’s wild, salmon-rich Bristol Bay that says the watershed could be harmed by mines such as the proposed gash in the earth known as Pebble. Sorry, a little bit biased on this one. Comment deadline is Monday, July 23. To file yours, go here. In 2008, I made a trip to the Mulchatna River to fish with friends and see some of the country that would be forever changed by the Pebble Mine Project. I’ve never been back–although I’d give most anything to fish those waters again–but the place is always with me. The strange, snow-etched Jackrabbit Hills, with the weird calligraphy of a million caribou trails crossing them and fanning out on the flat tundra like poetry written in a language that only hunters remember. Potholes aswarm with nesting waterfowl, and the deep prints of a grizzly way too close to the fish cleaning table. It’s all there in my mind, that land and the fish themselves, blood-red sockeye in cold green water, silvery kings thrashing in the shoals, the perfect dots on the side of an arctic char that look so much like tiny planets glowing in a twilight sky that it surely makes you wonder, really, how this world of ours came to be like this, and what it might mean, that a creature could be so beautiful. I carry those memories. I would never see the world quite the same way if I knew that place was gone, even if I never see it again myself. Now is the time for those of us who know what is there, and for those of us who would one day like to see it as it is, in the perfection of its creation, to be heard. Even if you never plan to go there, every fisherman and hunter is tied to this place. Whatever string you tug, whatever fish you take in whatever river, the whitetail in your woodlot or local swamp or marsh, it is all part of the net that includes the mighty Mulchatna, the Koktuli River, the wind and tide and fury and life of Bristol Bay. We live in a democratic republic and the whole process depends on responsible citizens who are willing to speak out and participate. Be heard. Meanwhile, following on the tails of other recent stories on Bristol Bay and Pebble Mine, PBS’s Frontline takes on the issue on Tuesday night. THE AREA WHERE ICY STRAIT MEETS GLACIER BAY IS THE GULF OF ALASKA’S BEST BET FOR TROPHY HALIBUT. State stats show it can be ground zero for highest average fish weight. For years, Ron Goode had traveled from one end of Alaska to the other in search of a barn door halibut. He’d come close off of Kodiak, and near Ketchikan, but he was still looking for his first trophy-size fish. Then, in the frigid waters of Icy Strait, Goode finally hit pay dirt. The 78-yearold Napa, Calif., man was fishing a whole king salmon head near the mouth of Glacier Bay when he felt the massive tug he’d been waiting for. Goode’s stiff halibut rod doubled over as a massive fish began peeling line from his oversized Penn reel. For 45 minutes, he went back and forth with the giant fish. It took nearly half an hour just to get it off of the bottom, and another 15 minutes to get the beast close to the boat. As he and the fish were near exhaustion, the giant silhouette of the halibut appeared below the surface. A few cranks later and the halibut’s basketball-size mouth came into view, with the 20/0 Eagle Claw circle hook latched into its jaw. Goode and his buddies could barely believe it. The fish was at least 6 feet long. They’d never seen a halibut that size. It was twice as big as anything they’d ever caught. With a quick jab of the harpoon and a single shot from a .410 shotgun, Goode’s first 200-plus-pound halibut was now subdued. The giant fish measured 76 inches, and weighed 235 pounds. Goode joined the barn door club in what is arguably Alaska’s most fertile trophy halibut grounds, the section of the Inside Passage between Elfin Cove and Gustavus. In most Alaskan ports, a 200-pluspound halibut would draw quite a crowd as it is hoisted onto the scale back at the docks. A fish that big would contend for first place in the Seward halibut derby. It would be one of the biggest fish of the season in both Homer and Ninilchik. But along the northwest end of the Inside Passage, a 200-pounder, while a fish of a lifetime for many anglers and one that most others can only dream about, barely turns heads. Individual charter captains catch dozens of 200- and 300-pound fish each season in Gustavus and Glacier Bay. A few 400-plus-pounders are landed every year. Fish pushing 500 pounds have been measured and released. No other area of Alaska yields as many halibut over 200 pounds for sport anglers as the fish-infested waters where Icy Strait meets Glacier Bay. Charter boat captains and commercial longliners refer to the North Pass of Icy Strait as the “Halibut Highway.” Most of the halibut that migrate into the Inside Passage and Glacier Bay to feed on herring, candlefish, pink salmon and pollock pass through the narrow waterway between Point Carolus and Lemesurier Island. The small fleet from Gustavus that fishes the pass each day lands more halibut over 100 pounds than charters do in any other part of Alaska, according to Alaska Department of Fish and Game creel surveys. The section also has the shortest angling effort time to get a limit, and by far the largest average size of halibut kept, state stats have shown. Two of the biggest halibut ever landed have been unloaded at the Gustavus dock. Last September, a 95-inch halibut that weighed an estimated 480 pounds was caught on a self-guided trip out of Gustavus. The year before, a 466-pound, 94-inch halibut was landed in the same area. Both would have contended for a new world record, but the closest IGFA certified weight station is 45 miles away in Juneau, and by the time the rod was handed off to other anglers and harpoons and shotguns were used to land them, it’s questionable whether they would have even qualified for the record. A few halibut between 475 and 500 pounds have been brought up to boats, measured and released in recent years. Witnesses say those fish were bigger than the 459-pound world record caught in 1996 out of Dutch Harbor. Aside from those monster fish brought in each year, and the hundreds of fish landed between 175 and 400 pounds near Gustavus, the area is the undisputed halibut capital of Alaska when it comes to average size fish. According to ADFG stats, the average size halibut kept in Gustavus in 2010, the last year the figures are available for, is 47 pounds. That’s substantially bigger than the 15-pound average out of Homer, Seward and Sitka. The only place even close is Yakutat, where the average size is around 30 pounds. The 10-year average also shows the average size halibut kept in Gustavus and the Glacier Bay area is three times bigger than Seward, Homer, Kodiak and Ninilchik. So even with a onefish limit, anglers fishing in Gustavus are likely to come home with more fillets than anglers fishing elsewhere. But it’s those really big fish that tend to draw anglers like Goode to the Glacier Bay area. Anglers who want a barn door have learned Gustavus is ground zero for the biggest halibut in the world. The mouth of Glacier Bay is one of the largest feeding areas for humpback whales during the summer. The tons of baitfish that attract the whales also draw in the halibut. There is so much food that fish swimming along the Halibut Highway often spend the entire summer in the small area near the North Pass to fatten up on the herring, candlefish, pink salmon and other abundant food. Some halibut will continue on the Halibut Highway toward Juneau, Hoonah, Skagway and other Inside Passage harbors, but most stay where the food is. After all, it takes a lot of herring or small salmon to keep up with the appetite 300- or 400-pound fish, and the strong currents colliding at the mouth of Glacier Bay and the North Pass trap untold tons of feed. From May through September, the halibut fishing is wide open. It’s not uncommon for an angler to release a dozen fish before settling on the halibut he or she wants to keep. Sometimes it’s that 200-pound barn door. Often it’s a 30- to 40-pounder, considered to be the best eating size. While anglers aboard charters in other Alaska communities may sort through half a dozen small fish just to catch a 15-pounder, anglers in Gustavus are known to release 100-pounders so they can get that perfect 45-pound fish with prime fillets. A large halibut caught in the area, including first. After all, many anglers can’t even when a big fish hits, it can take the bait and run without feeling resistance. Using leverdrag reels, the tension is increased as the fish makes off with the bait. Fighting belts are needed to give anglers a chance to land the giant fish. Gustavus, population 460 as of 2011, is the smallest community in Alaska with jet service from Alaska Airlines. The town is 45 miles to the west of Juneau. The afternoon flight from Seattle to Juneau continues to Gustavus each day during the summer. Smaller prop planes also make dozens of flights a day between Gustavus and Juneau. There also is ferry service. Most anglers come for a five-day trip and stay at a lodge, although some open charter seats may be available. Alaskan Anglers Inn (alaskasportfish.net) is the largest fishing lodge in town, with six boats. Anglers fish four or five to a boat and once limits of halibut are caught, lingcod, king and coho salmon and rockfish are targeted. 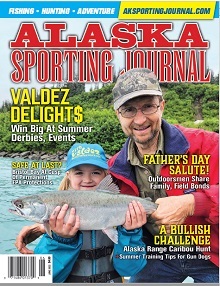 Editor’s note: Editor’s note: The author is an Alaska fishing guide and charter boat captain who skippers out of Gustavus for Alaskan Anglers Inn. His Web site is wildriversfishing.com. No, you are not looking at the skull of some prehistoric species of alligator that once slithered through the swamps of Alaska when it was at a more southerly, tropical locale. Nor is it the snout of a wolf or husky – but it is something of an honorary member of the canid family. It’s Oncorhynchus keta, better known to anglers as a chum salmon and sometimes called dog. The image was snapped on a gravel bar in the Togiak NationalWildlife Refuge, and probably belonged to either a female or subordinatemale, speculates a salmon biologist on one of the WestCoast’s chummier rivers. “Dominant males tend to growsome really nasty teeth, and often a set of canines. Subordinate males grow less in the way of teeth. But different populations can have larger or less impressive dentures too, so it depends a lot,” says Brett Barkdull. The reason for that fearsome grill isn’t so much to savage seafood – out in the Pacific chums mainly feast on tiny crustaceans and soft-bodied mollusks, squid and worms – but for their brief time in the rivers. brown bears, but Barkdull – whose gig requires himto wade salmon streams – didn’t exactly laugh at that one. “When they are spawning, watch out. The U.S. Environmental Protection Agency today released for public comment a draft scientific study of the Bristol Bay watershed and its natural resources. EPA’s report responds to growing interest in large-scale mining in the watershed from a number of stakeholders and local communities with a range of views and will lead to a better understanding of potential environmental impacts of these activities on the watershed. Under the Clean Water Act, EPA has the authority and responsibility to protect the nation’s water and perform scientific studies that enhance the agency’s and the public’s knowledge of water resources. EPA’s focus in the assessment is scientific and technical; the agency has made no judgments about the use of its regulatory authority under the Clean Water Act and the draft study in no way prejudges future consideration of proposed mining activities. The report assesses the watershed’s natural resources and the economic benefits associated with those resources, including the largest undisturbed wild sockeye salmon run in the world. EPA’s draft study does not provide an in-depth assessment of any specific mining project, but instead assesses the potential environmental impacts associated with mining activities at a scale and with the characteristics that are realistically anticipated, given the nature of mineral deposits in the watershed, the requirements for successful mining development, and publicly available information about potential mining activity. The report concludes that there is potential for certain activities associated with large-scale mining to have adverse impacts on the productivity and sustainability of the salmon fishery in the watershed. Potential impacts could include loss of habitat used for salmon spawning and rearing. The assessment, when finalized following the important public comment and independent peer review, could help inform future decisions on any large-scale mining in Bristol Bay by both federal and non-federal decision-makers. The draft assessment focused on the Nushagak and Kvichak watersheds, which produce up to half of all Bristol Bay salmon and are open to mining development under Alaska law. · All five species of North American Pacific salmon are found in Bristol Bay. The Bristol Bay watershed supports the largest sockeye salmon fishery in the world. The Kvichak River produces more sockeye salmon than any other river in the world. The Nushagak River is the fourth largest producer of Chinook salmon in North America. · Bristol Bay’s wild salmon fishery and other ecological resources provide at least 14,000 full and part-time jobs and is valued at about $480 million annually. · The average annual run of sockeye salmon is about 37.5 million fish. · Bristol Bay provides habitat for numerous animal species, including 35 fish species, more than 190 bird species and 40 animal species. EPA also examined the importance of Bristol Bay salmon in sustaining the traditional subsistence lifestyle of Alaska Native Villages in the watershed. The assessment includes detailed reports on Bristol Bay indigenous culture, wildlife and economics, as well as salmon and other fish. EPA will take public comment on the draft assessment until July 23. The agency has also scheduled public meetings in Alaska in June and will host webinars for people interested in learning more about the assessment. EPA is also submitting the draft assessment for independent scientific peer review. All of this information will help guide a final report. For information on public meetings and how to submit comments, visit our website: http://www.epa.gov/region10/bristolbay/. Even if you’ve got friends or relatives living in Alaska, and even if they’re avid hunters and/or fisherpersons, nobody knows everything there is to know about all the guides, transporters, flight services, etc., in the state. So unless you’ve got an “in” with a local, you’re probably going to have to look around for info. One of the better ways to do this is to go to a sportsman’s show. Lots of Alaska companies and individuals make a point of attending these shows to drum up business, and it’s a good way for you to have a face-to-face meet-up with someone instead of conducting your business by email or phone. That said, we don’t want to destroy any illusions you might have about your fellow man, but not everyone in this business is destined for sainthood. While out-and-out fraud is rare, there are people whose business and people skills leave something to be desired. As someone who was once left in the Wrangell Mountains for an extra week by an unscrupulous pilot, I’ve learned the hard way to check out operators ahead of time, and to pay attention to warning signs. One of the most valuable tools you have at your disposal when interviewing prospective businesses is your gut. If the other person is at all evasive about giving direct and informative answers, seems defensive when you ask hard questions, or just gives off a bad vibe for you, walk away. Chances are that there’s someone else operating in the area you’re interested in who you can talk to. Ask around, do your homework, and trust your instincts. What’s your background in this field? Where do you live in the off-season – are you full-time Alaska resident or a seasonal operator? Find out about all the costs associated with your trip. Can you save money by shipping gear to your location ahead of time to cut down on airline fees? In the case of remote lodges, does the fee quoted include transportation to the location from the nearest airport or ferry terminal? For guided hunting and fishing trips, are there fees for processing your fish and game? What will it cost to ship meat and fish home? If you’re looking at a multi-species trip, what are the peak seasons for the fish or game you’ll be after? If you’re planning on something like a deer and ducks combo, or a cast-and-blast hunting and fishing trip, quite often the peak seasons for both species won’t coincide perfectly. You’ll have to decide which is more important to you, and take the chance of getting skunked on your secondary target. Actually, you’re taking a chance of getting skunked no matter what you’re going after, but that goes without saying. Ask about the normal weather conditions for the time you’re considering, and also about available daylight. Daylight hours become a real issue the farther north you go and the later in the season you’re looking at. THEN THERE’S figuring out how many days you’ll actually be hunting or fishing during the trip, says Larry Carroll of Kodiak Adventures Lodge. John Rodriguez of J&J Charters on Prince of Wales Island suggests that you find out the schedule for getting to and from your final destination and work backwards from there when making your ferry and airplane reservations. If you find out you have to spend an extra day’s food and lodging in a port city, it can add considerably to your costs. FIND OUT HOW MANY people will be in camp when you’re there, and if you’ll be sharing accommodations with people not in your party. This isn’t always a bad thing, but you should know the arrangements before you get there. Ask if there are other lodges or camps in the area, how close they are, and how many people they usually have in camp. Ask about facilities for cleaning and butchering your stuff, and ask about freezer space. Do they have shipping boxes on hand, or do you have to supply coolers or boxes. Ask about references. It’s best if they’ll give you contact info for people to communicate with – a rave review by “Jim S. of Seattle” on a Web site is worthless. There’s always the chance that they’ll just hook you up with a buddy who will give a good recommendation, but that’s where your gut instincts will work for you again. AND FINALLY, ASK about deposits and cancellation and refund policies. Get that in writing before you turn over your hard-earned dough. The recent economic downturn has hit many operators hard, and that can turn out to be a double-edged sword. On the one hand, you might be able to bargain a bit when it gets down to the bottom line, and an outfit that’s running at less than full capacity might be willing to deal. On the other hand, if a company has had to reduce staff and maintenance costs, it could mean that the stellar reviews you get from last year might not still be applicable. If you perform due diligence on your trip, check as many info sources as possible, and trust your instincts, you’ll probably have a great trip. Keep your expectations reasonable, your sense of humor in place, and have fun! Fishery manager terms estimated return of 160 million a ‘top 20 percent’ year. The 2011 salmon sportfishing season was the usual mixed bag of ups, downs, missed predictions, surprises for biologists, and just general chaos. However, there were more than a few bright spots in the season, and very few total washouts. In Southeast, salmon fishing for kings and silvers was pretty much in line with projections, with pink salmon being the biggest shortfall. However, since pinks are rarely targeted by sportfishers, this was mostly a commercial fishing problem. In the Bristol Bay area, Chinook “returns were consistent with expectations, and there weren’t any emergency closures for kings out there, and the runs weren’t as bad as last year,” said Craig Schwanke, fisheries biologist for the Alaska Department of Fish & Game. The Nushagak sonar counter tallied nearly 60,000 kings for the year, peaking around the third week of June, so compared to other years, a middle-of-the-road return. Red salmon numbers for the area were better. According to Schwanke, all the escapement goals for sockeyes in the Bristol Bay region were met, although some commercial openings had to be curtailed in order for that to happen. Silvers in the region were not noteworthy for being either high or low for the year, chums aren’t managed in Bristol Bay, and pink salmon are an even-year occurrence, so there weren’t any humpies to speak of out there. The 2009, ’10 and ’11 seasons were quite similar in numbers of kings present in the river, and the surveys show a pretty steady decline in return numbers since 2003 when over 55,000 fish were estimated to have passed by the sonar counters. This is known as the most popular sportfishing venue in Alaska, so when things are bad on the Kenai, it tends to have a ripple effect on businesses on the Kenai Peninsula and throughout Southcentral. In Upper Cook Inlet, the Deshka River aims for a Chinook escapement between 13,000 and 28,000 fish, and the counters came up with about 19,000, right in the middle of what they aim for, according to Sam Ivey of the Palmer Fish & Game office. The streams on the east side of the Parks Highway in the Mat-Su Valley are a traditional hotbed of activity for Valley and Anchorage anglers, but this year numbers were down, and the Board of Fish decided to try and reduce the catch numbers by cutting off one weekend of fishing and to prohibit overnight fishing. Even with these restrictions, there were still a number of escapement goals that weren’t met in the Talkeetna drainage. As for why king numbers are lower is anybody’s guess, but the fact that it’s consistent over such an enormous area and length of time points to something going on at sea – climate change, commercial fishing issues, hatchery fish outcompeting natural runs, baitfish problems, long-term ebbs and rises in salmon populations. Silvers in Upper Cook Inlet provided fair to good fishing, but not anywhere that consistently produced hot fishing. According to Ivey, the reduced numbers of coho salmon in the inlet were an area-wide phenomenon, which probably points to marine survival issues. Whether that’s a function of water conditions, intercept catches by the commercial fleet or any one of a number of other factors, nobody knows, but quick turn-arounds are possible. “Coho rebound numbers can be spectacular – sometimes it only takes a few coho to make a lot of coho,” Ivey said, so there’s always hope. Stay tuned. One saving grace for the year was a great chum salmon return. While most people don’t target chums, they can be a great way to enjoy some fishing action while pursuing silvers – catch a few nice chums, release them if you don’t care for them as table fare, and hone your reflexes while you wait for a silver to happen by. The other nice surprise was the red salmon run in the Kenai River system. The sonar counter near the river mouth counted over 1.6 million fish by the time it was shut down, the sport limit was doubled to six fish per day, and personal use dipnetters had a banner year in the Kenai and Kasilof Rivers. While the runs in the Russian River never quite lived up to the standard set in the Kenai, overall the numbers in the whole system were quite good. If you look at the big picture for the year, there were more than a few bright spots, and, as far as sportfishers were concerned, no real disasters to speak of. The worst you can say about many spots were that the salmon fishing was “average,” but average for Alaska is pretty spectacular for anywhere else. AS FOR WHAT TO EXPECT for the future, the department will gather all the data from the fish counts and catch numbers over the winter, and try to come up with a good guess as to what to expect for 2012.